Leading Manufacturer of comprehensive mechatronic training platform from Jaipur. The Comprehensive Mechatronics Training Platform (GMS- series) developed by Googoltech was specially designed for the purpose of training, testing and problem diagnosis of mechatronics facilities. The platform can combine arbitrary with AC servo, DC servo, step motor or Inverter to form a highly configurable control system in motion control and mechatronic technology. 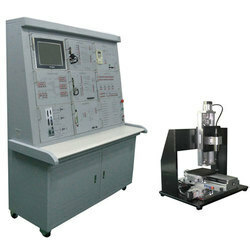 As a comprehensive experiment platform for the students in the field of mechatronics and motion control, the GMS can achieve two major categories of experiments, such as (1) mechatronics and motion control technology, which contains typical sensing technology, motor control motion controller, PC based control, and CNC control, etc. and (2) problem diagnosis, which contains many typical experiments in problem diagnoses and analysis. Module design, free and multiple combinations of AC servo, DC servo, Step motor or Inverter, etc. All I/O signals are clearly displayed in the front panel, easy to operate. Pin-slot configuration structure, convenient to put in wiring operation. Open architecture with the use of Googoltech＊s powerful motion controller, users can control and programming under MS Windows operation system. With the use of provided software, users can control the motion control process under either simulation or actual control conditions. Real time problem diagnosis, the problem can be set up manually either on-site or remote through network. Looking for CAD-CAM-CAE Software Group ?